It's the turkey day special of the Kosher Cooking Carnival. Well, for those living in the US it is and thank you for taking time between football games to take a look. TechyDad is a first time contributor and I certainly hope he becomes a regular. He presents us with Cooking With TechyDad: Sneaky BonBons posted at TechyDad, a great way to get your kids to eat more veggies and not even realize it! Jo shows us how to make Roasted Garlic Spread that would be perfect on pita or challah. Batya presents Menu Conversion, Or What to Serve for Special Meals, Like Thanksgiving posted at me-ander. Avital Pinnick presents Tender, Flaky, Sourdough “Naan” posted at This and That. Batya gives us Cottage Cheese Cheesecake from a cookbook that came with the blender and while the machine pictured in the cookbook looks older than I am, the recipe looks timeless and tasty! Hadassah Sabo Milner helps anyone with the dilemma of whether to make pie or cake with this recipe for My World Famous Delicious Pie Cake posted at In the Pink. My sweet contribution is a versatile Cookie Brittle. Mary Jones presents 12 Simple Tips to Make Drive-Thru Dining More Healthy which offers great tips to making fast food a bit healthier. Lester Christmas presents KAHLUA Original K-Cups from Timothy's World (certified by the KSA) for those of you who love your java. Annette Berlin gives us an easy Tomato Pesto Sauce over at Craft Stew. Batya whips up Easy Stove-Top Steak at me-ander. I make a broccoli salad I deem Pretentious Cole Slaw at YESHASettler. And to go with that, why not try Felafel-crusted Chicken Strips. Leora offers up a Mushroom Barley Soup perfect for the cold winter nights. mominisrael presents White Sauce in the Microwave posted in her new food-related blog Cooking Manager. She also offers us Sourdough Muffins to try. Batya wonders Is The Veggie Option Really Kosher? posted at me-ander. Jerusalem Kosher News tells us about the milk shortage here in Israel which is also affecting butter availability posted at Jerusalem Kosher News. This site also seems to be a great resource for Kashrut alerts in Israel. Crafty Rose offers us origami candy boxes which would be perfect for Purim. Wait... we haven't even had Chanuka yet. Am I allowed to utter the 'P' word? Jon Baker and his lovely wife give us their review of The Solo Restaurant Experience posted at ThanBook. Batya has a review from her recent trip to the US in Eating Kosher in Great Neck, Three Meat Restaurants in This Review. She also warns us that even though a rose by any other name may smell as sweet, restaurants bearing the same name may not all be kosher. So Beware: Cafe Aroma is Traif in Great Neck!!. I Stand up for my order when service was lousy and the food cold. Back in July the Kosher Gourmet did a review of Mike's Bistro posted at The Kosher Gourmet. Mrs. S. presents The poor step-sister of Shabbat kugels which is her ode to the lokshen kugel. Newsman presents The Great Pumpkin Cholent posted at The Kosher Kook. So would that make it a very Charlie Brown Shabbat? Hadassah Sabo Milner presents Chicken soup with matzah balls. Felisa Billet presents Entertaining: Turn Thanksgiving Leftovers into Friday Night Dinner posted at Kosher.com Blog. Wise_Bread tells us 5 Quick Fixes to Salvage a Good Meal. Emily Moser warns us about 25 Common Foods That Can Be Toxic for Your Pet. Liked what you saw? Help spread the word! * Why not submit your own recipe for next month’s carnival? Just chose one of your own blog posts and go to the carnival submission form. It’s easy to fill out. * And since part of the idea is to help publicize each other’s blogs, please link to this post on your own blog. Spread the good word! * Batya’s always looking for someone to host a KCC. Email her with your hosting offer here: shilohmuse at yahoo dot com. 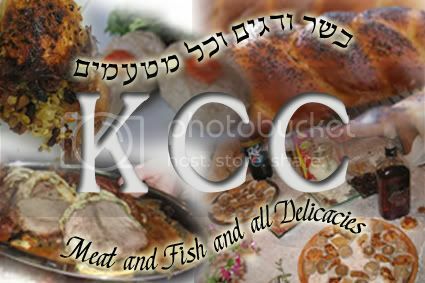 * Next month’s KCC will be hosted by Kosher.com. Thanks for the Thanksgiving treat. its not yet 630 am here and I am salivating big time. thanks for the link!